We’ve always taken the security of our websites seriously. From building robust and industry leading websites through to our insistence on breach insurance and proper firewalls to help us bounce hackers, ensuring our website is as close to impenetrable as possible is a key concern. We’ve had SSL (Secure Socket Layer) protection since 2013, long before it was ‘the norm’ and long before just about every other competitor of ours. Whilst this means our website has been secure, and offered a secure connection between you and our servers for many years, we’re very proud to now be sporting the coveted EV SSL (Extended Validation Secure Socket Layer) as well as McAfee Secure Certification. What is EV SSL, and what does it mean? That we are effectively ‘who we say we are’. For you as a ‘consumer’ it means not only is your connection between our website and you secure, you can be absolutely assured we are who we say we are – and the McAfee SECURE Certification backs this up. How Do I Know BMABA Has EV SSL & Who Else Has This? Look at your browser’s URL bar. The standard green padlock is gone, and it’s replaced by the coveted green address bar. This is the same green address bar you’re probably familiar seeing only on very secure, professional websites – such as your bank or credit card provider’s websites. We’ve done some digging around, and at the time of writing we are the only martial arts association in the United Kingdom to have EV SSL certification in place. Only a tiny fraction of companies will ever have this coveted level of protection active, so we’re very proud to have made it through the vetting process. 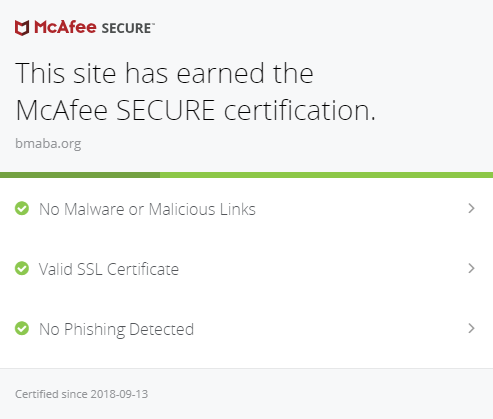 If you click on the McAfee certificate at the bottom right of the screen, their independent service will confirm we are who we say we are, and that our site is both secure & virus free. This means you’re safe to share important or confidential information with us online. Click below to see our independent McAfee security certificate page. Not a BMABA member yet? Prev:Sports Association Of The Year Finalists 2018! Next:We’re Now An Award Winning Association!